Man Up With a Shearling Jacket | Valet. The badass leather outerwear your winter wardrobe deserves. There's no doubt bombers are having a moment. And when you think of bombers, you're probably thinking of the nylon and silk variety. But I'm proposing we take it a step further by spinning the clock back a few more decades. 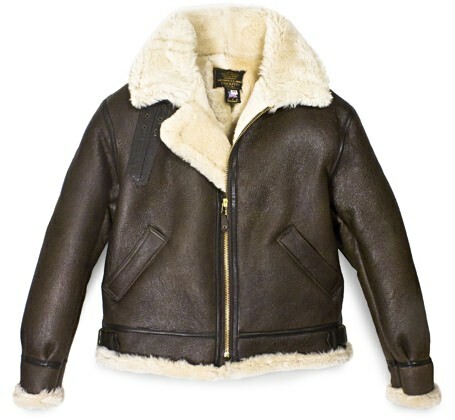 I give you, the shearling bomber jacket. During the massive bombing campaigns of WWII, the bomber aircraft of the Allies were large unpressurized beasts, with open panels to allow the firing of machine guns. The temperature regularly drifted into the negatives, and so the aircrews needed a coat they could rely on to keep them warm. Shearling jackets were the solution. Several models were produced by the allied forces over the length of the war, though all shared the common features of rugged leather construction, warm lamb's wool lining, and large, buckle-enabled collars to keep out the freezing winds and weather. 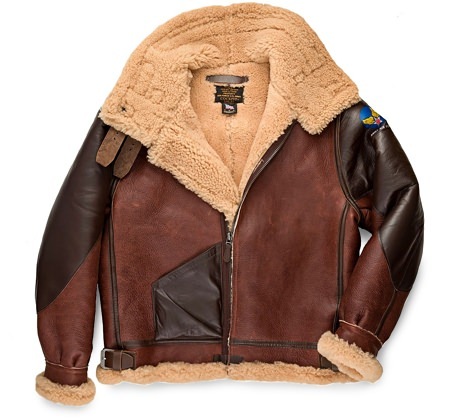 While I doubt any of us will find ourselves in an open B-17 or Lancaster bomber 10,000 feet over the Axis powers this winter, I think you'll agree that the bomber jackets of the Greatest Generation are the perfect way to add a shot of old-world dash to your wardrobe this winter. They're the kind of jackets that make any man look both tough and handsome. 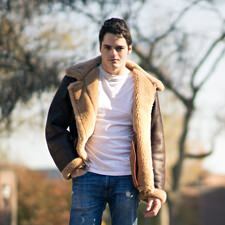 Below, I've picked out three of the most iconic shearling styles from Cockpit USA, the premier maker of military-spec garments. Each has its own distinct style and will make you stand out from the crowd of standard leather jackets. They're not cheap, of course, but they are made in America by the same craftsmen that currently supply the leather jackets to our brave Navy and Marine Corps aviators, so they'll be sure to last your lifetime. 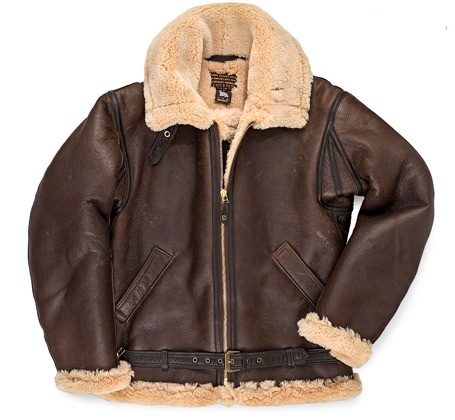 First designed in the early '30s for British Royal Air Force fighter and bomber pilots, this grew to be one of the most iconic jackets of the war. Its trimmer fit, dark color and adjustable waist belt make it ideal for motorcyclists and James Dean types. Best paired with a simple T-shirt, some jeans and sturdy boots. This modern version has had slash pockets added to make it even more functional than the original. The Big Daddy of the bomber jackets, this American icon was worn by US aircrews and General Patton himself (and is a current favorite of Arnold Schwarzenegger). A badass piece of outwear, this looks great when paired with some washed jeans, your favorite button up shirt and a bold-faced pilot's watch. The cousin of the original B-3 and done up in russet red leather, featuring the original map pocket and Army Air Corps patch on the shoulder. From jeans to chinos, the 1941 jacket adds a worldly, rugged flair to your entire wardrobe. Save over $100 by using code BOMBER10 for 10% off your purchase at Cockpit USA. You want one. You need one. Here are 21 of the best in a range of price points. How Taylor Stitch resurrected a 40-year-old grail vintage piece to craft some badass outerwear.